Make cutting the grass a faster, more efficient process—and keep your turf in tip-top shape—with these techniques. If you’ve got grass, it may feel that the more you mow, the more it grows! But keeping your lawn neatly manicured is a must for optimal enjoyment and curb appeal. So rather than go at it in a haphazard manner, follow our tips for how to mow a lawn quickly and smoothly while still ensuring the health of your grass. Then kick off your shoes and love your lawn! The quality of your mowing is directly related to your equipment. 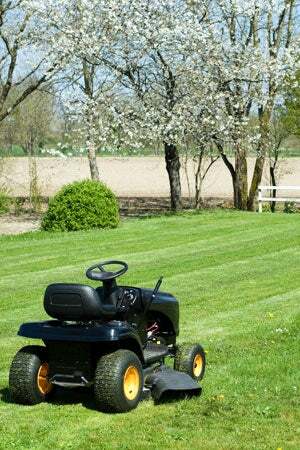 So keep up with regular mower maintenance, like checking the oil, tire pressure, and cleaning the deck and blades after use. A most important task? Ensuring that those blades razor sharp. Dull blades tear rather than slice grass, making it more difficult for your lawn to recover; sharp blades will also reduce mowing time. The rule of thumb is to sharpen mower blades twice a season, once in the beginning of spring, and once halfway through the summer. Tip: Never mow wet grass! That will clog your mower deck, causing it to clump as it discharges, leaving blobs to decay all over your yard. Before you get behind the mower, trim and edge your yard to lessen the risk of damaging trees, plants, and hardscaping by getting too close with your mower. Plus, weed whacking around obstacles like trees, mailboxes, and fences will make mowing a lawn go faster, because you won’t have to work tediously around them. Edging around garden beds will prevent turf grass from encroaching onto your landscaping plants, and you won’t need to continually pull that grass back by hand. Resist the temptation to let your lawn get knee high and then give it a crew cut. Mowing more than 1/3 of the length of grass blades prevents optimal photosynthesis. Make a point of mowing approximately every five days in early spring and late fall—your lawn’s growth spurt periods. 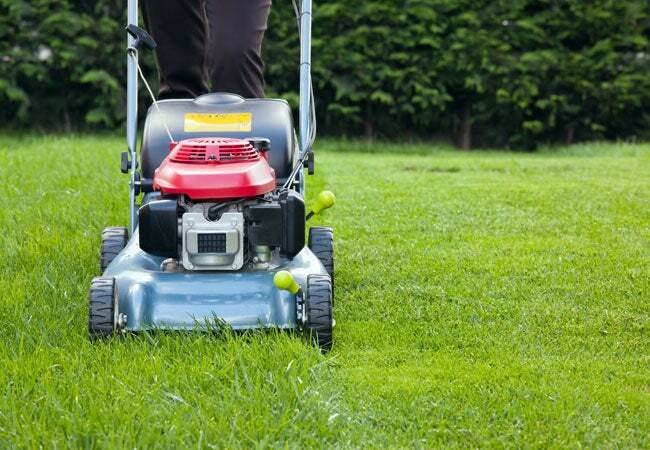 If you should be late in mowing, raise your blade height to keep from taking off too much plant tissue. Then, mow again in a couple days if you’d like a shorter lawn. Also keep in mind that the best time to mow is in mid-morning, between the hours of 8 AM and 10 AM. Early morning dew will have evaporated, but grass won’t be limp from harsh, midday sun. Once you fall into a mowing routine, you may be inclined to always cut exactly the same way. Don’t! To reduce turf wear and soil compaction, change direction each time you mow a lawn. Go horizontally one day, vertically the next; try to master the beautiful diagonal rows of a professional baseball diamond, or mow in circles like a Zen labyrinth. Just be sure to switch it up. There are two ways to go with clippings. Some people bag them in the interest of preventing a layer of thatch developing at the grass roots, but if you choose to collect clippings, add them to your compost pile—they’ll yield beautifully rich soil for landscaping and pots. However, as long as you mow a lawn regularly so that clippings aren’t overly long, it’s fine to leave them where they fall. They’ll break down and provide much-needed nutrients for your lawn, with no ill effects to the roots. When running through the steps for how to mow a lawn properly, the last always involves removing any stray clippings from paths and driveways. Whether you blow the clippings back onto the lawn with a blower or sweep them up with a broom, it’s a neat finishing touch that’s also kind to your community and the environment. Lawn waste left untended can wash into storm drains leading to clogs, and can make its way into rivers and lakes to cause phosphorus pollution. Sounds easy enough, right? Well, not so fast. You might need to break a few bad mowing habits before you earn the reputation as the top groundskeeper in the neighborhood. Watch our video to learn some of the biggest mowing mistakes you should avoid. Then get out in the yard and put your newfound knowledge to use.